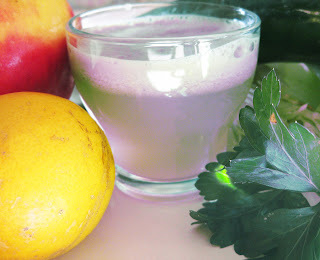 This is my recipe for an energizing and healthy drink. It is a great alternative to coffee for when you feel like a lift. To make enough for two people, all you need are the following five ingredients and an electric juicer. A word to the wise: most fruit and vegetables can be processed washed and unpeeled, except for citrus, the skin of which is very bitter and will be detrimental to the taste of your juice.